Deck of 100 Virtue Reflection Cards. Each individual virtue card defines the meaning of the virtue, provides an inspirational quote, guides us in the practice of the virtue, and provides an affirmation to awaken and inspire the practice of virtue. Deck of 100 Virtue Reflection Cards. 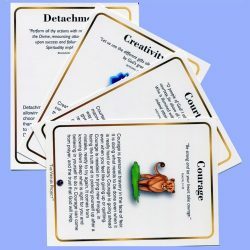 Each individual virtue card defines the meaning of the virtue, provides an inspirational quote, guides us in the practice of the virtue, and provides an affirmation to awaken and inspire the practice of virtue. There are many ways to use the Virtues Reflection Cards: for guidance in making a decision, healing a relationship, journaling, clarifying our direction, or simply providing a spiritual focus for the day. The cards are inspired by The Family Virtues Guide. We also have family virtue cards for use with children and classroom virtue cards for use in a classroom.